The focus of the series Finion is on a comprehensive lighting system. Lighting elements that are supposed to look like the lights of a big city are skillfully integrated into the bathroom elements. The mirrors, vanity unit, the wall-hung tall unit and the wall shelves are discreetly lighted towards the wall, creating a relaxed atmosphere. The shelves have an additional interior lighting, which together with the discreet yellow tones, conjure up an elegant look. The whole thing is supported by the metallic ring under the bathtub, which is also lighted to the ground that makes it float visually. 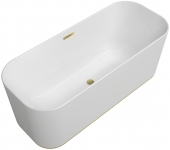 The washbasins and bathtubs have thin edges with extreme stability. This is made possible by the new material TitanCeram, which is applied in the ceramic products of the series. Furniture, bathtub, sink and toilet are together forming a luxurious overall picture, that never looks exaggerated. Like the lights of a big city, the lighting system of the bathroom series Finion fits into your bathroom and creates a wonderful atmosphere. You can find direct and indirect lighting, for example, under the bathtub, so that it appears to float or around the mirror. The LED lamps can be infinitely variable dimmed using the remote control with the emotion function, thus always adjusting the lighting to suit the situation and your mood. The handle-less furniture can be adapted to your individual wishes. The series includes vanity units, tall vanity unit (wall-hung) and shelves. These are available in different versions. For example, the vanity units have either a closed front, a shelf or several shelves integrated. The interior design is comfortable and practical. Storage boxes and shelf inserts are included. You can choose according to your taste, one of the ten lacquer colors or real wood veneer for the surface and lighting. You can put together your individual colors. Two colors are available for the flush plate, ten for the fronts and if you choose the version with shelf, there are eleven colors to choose from. If you want, your vanity unit can be three-colored and thus bring variety and individuality to your bathroom. A special highlight is the wireless charging station, which optionally includes in your bathroom furniture. For example, you can listen to music in the bathroom or wait for a call without having to worry that the battery could not last. To use this feature, you need a Qi-enabled phone or a special phone case. As lighting in the Finion series plays a major role, all bathroom furniture is also equipped with LED lighting that can be switched dimmable from warm white to daylight white light. Thin wall thickness, which is made possible by the material TitanCeram, are also used for the basins. Nevertheless, the basins impress with their exceptional stability. For every bathroom, Finion offers the right basin in the right size. For a better visual appearance, the washbasins are optionally available with concealed overflow. Here you can find the right size and shape for every bath: round, oval or square, with only 28 cm or even 130 cm wide. In terms of color, the basins are available in White Alpine, Star White and Edelweiss. In addition, they are coated with CeramicPlus, which makes the basin particularly easy to care for. Lime and dirt simply flow together with the water into the drain, making cleaning easier. The smooth surface makes it easy to remove dried lime stains. The built-in variants offer three options: cabinet washbasins, built-on washbasin unit and wall wash basins. Some of the basins have a tap hole bench, which can be used as a practical storage and saves space as the tap can be attached directly to the basin. The basins of the series Finion are also available as double basins. You can choose the variant with two basins directly next to each other (1300 x 470 mm) or a long basin (1000 x 470 mm) with two taps. The 430 x 390 mm version is recommended for a small bathrooms or guest bathrooms. The mirror is optionally integrated in the overall lighting concept and the light can be controlled by a remote control. In addition, an anti-fog function and a sound system can be selected. Depending on your bathroom concept, you can choose the mirror in square, upright or landscape format and in different sizes. The widths go from 600 mm up to 1600 mm and the heights from 750 mm up to 1000 mm. The hanging WCs made of sanitary porcelain are equipped with AquaReduct® and the rimless DirectFlush technology. AquaReduct® ensures that water consumption is significantly reduced. With 4.5 liters, these toilets require 1.5 liters less than other toilets and still have the same flushing effect. With DirectFlush, your toilet is rinsed clean as the water reaches the complete toilet bowl and no residue can be trapped under the flushing rim. The toilets and bidets of the series Finion are made of sanitary porcelain and coated with CeramicPlus, which ensures improved hygiene. The freestanding bathtubs with their precise sidewalls and edges become an eye-catcher in every bathroom. Optional elegant decorative trims, push-to-open valves and bath spout in metallic shades round off the overall picture. Together with the optional Emotion function, a pedestal of light under the bathtub creates a floating visual illusion. The floating visual illusion is supported by very thin edges and side walls. 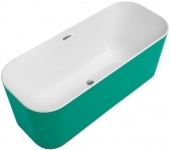 The bathtubs are available in the size 1700 x 700 mm. Here we have diversity of colors. Over 200 colors and decorative trims in several noble metallic shades are available so that everyone can individually assemble a bathtub that not everyone has in their bathroom. You can choose between Alpine White and Star White in the interior of bathtub. The bathtubs are made of the high-quality material Quaryl®. It consists of 60% quartz and high-quality acrylic resin, which is slip-resistant, sound-absorbing and easy to clean. There is one remote control for the complete Finion series. With the remote control, brightness can be continuously variable dimmed, lights can be switched off and on, mirror heating can be controlled, and the lighting device can also be controlled according to your mood. The remote control has a memory function and can be quickly stowed away behind the mirror surface using a magnetic holder. The bath series has already been awarded the iF Design Award 2017 and the Red Dot Design Award 2017, which are two of the most important design awards in the world.